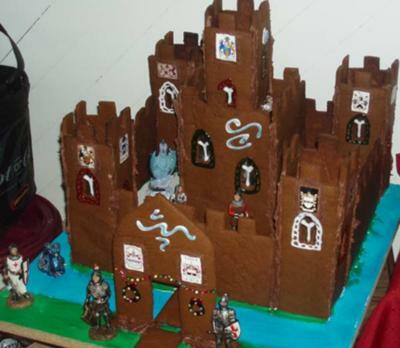 This gingerbread castle pattern can be made a number of ways, from quite simple to fairly elaborate: With or without a center tower and with or without turrets/cones on top of the towers. 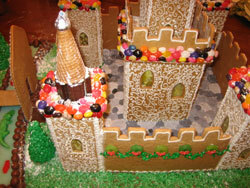 The medieval and haunted castles below are both WITH a center tower but WITHOUT the turrets. 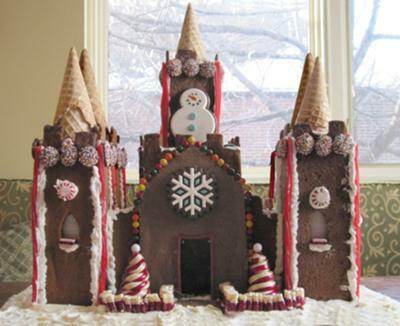 Add turrets (use ice cream cones), decorate it pink, and it becomes Cinderella's castle (leave out the bloody fountain too!). 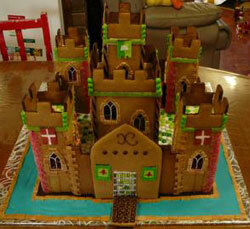 The second row of pictures below shows a great example of an elegant castle with cone turrets. 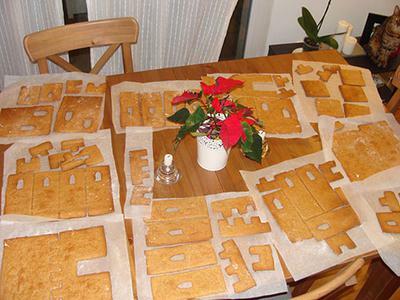 What Will You Get With Your Template? 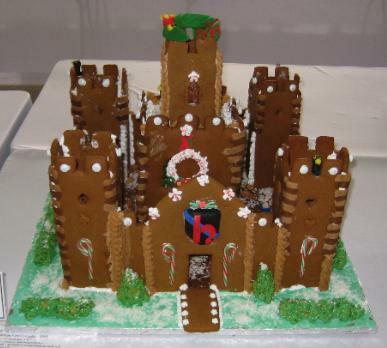 To use your castle template, you simply print the .pdf file (we suggest printing the pattern pages on thick, card stock paper, but regular is fine too), cut the pattern pieces out of paper, lay them on your rolled out gingerbread, cut along the lines, bake, assemble, and decorate. Don't forget to take pictures along the way! 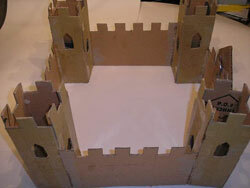 Note: you can enlarge or shrink the castle by adjusting your printer settings. 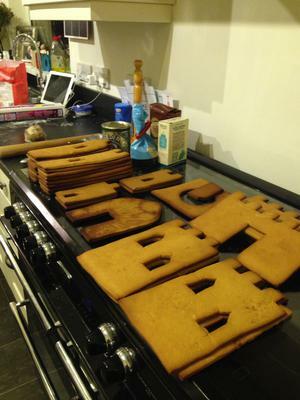 Here's a great castle submitted by Nick Norie of Denver, CO.
Wendy Johnston from Belfast, Northern Ireland shared this photo of her castle pattern cookies fresh out of the oven. 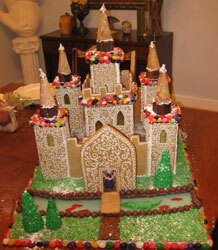 And here's another reader's cookies out of the oven, just waiting to be assembled into the beautiful castle below. 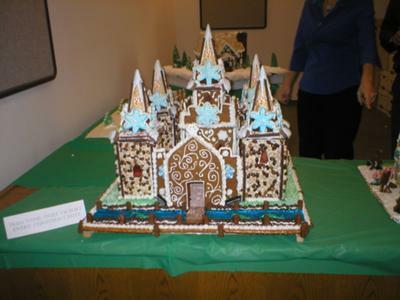 Sandrine's finished product! 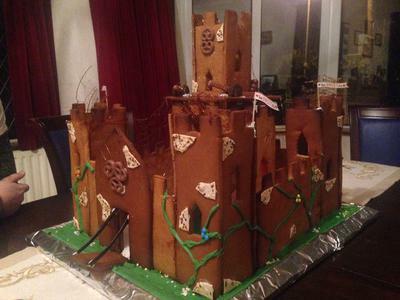 Thank you for sharing Sandrine from Paris! 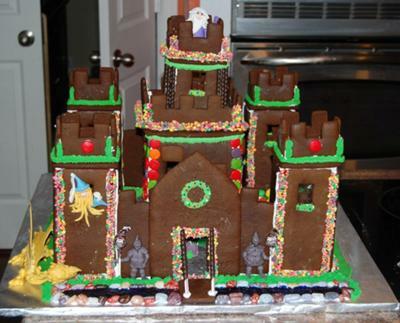 Karen Aschoff from Grass Valley, CA shared her award-winning "Castle Wonderland". 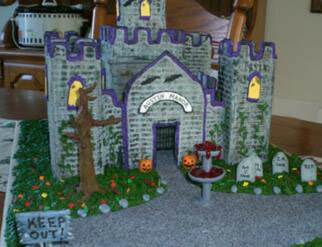 Amy from Coppell, Texas shared her "Wizard's Castle". 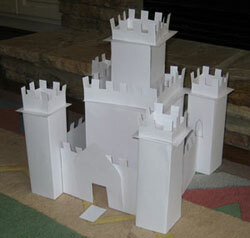 Lydia from Alberta, Canada shared this castle that she built with her son. 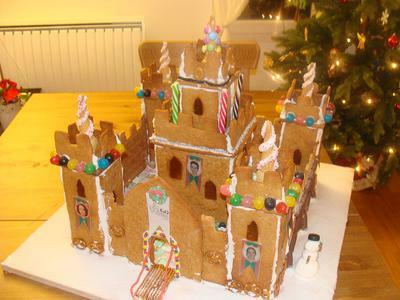 Return Home from gingerbread castle template page.